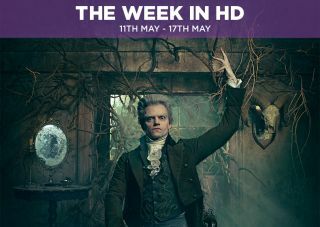 The Week in HD – The Affair, Jonathan Strange & Mr Norrell, Mad Men | What Hi-Fi? The Theory of Everything is the critically acclaimed and Award-winning film about physicist Stephen Hawking and the relationship with his wife Jane. It's a moving, sympathetic portrayal of the ups and downs of their relationship, from their first meeting in Cambridge, through the years dealing with Hawking's motor neuron disease and his subsequent elevated celebrity status following the publishing of A Brief History of Time. Eddie Redmayne rightly won an Oscar for his incredible portrayal of Hawking, while Felicity Jones is outstanding in her role as Jane - her quiet acceptance and suffering as she deals with being married to Hawking is masterful to watch. Worth watching for the lead performances alone. Jurassic World is just around the corner (well, a month away) but Universal Studios has seen fit to release another edition of the Jurassic Park trilogy on Blu-ray. Essentially a story of how man fiddled with dinosaur DNA and created a amusement park full of deadly dinos, the original is comfortably the best of the lot (with John William's soaring main theme helping). The other two films are decent but miss the magic of the original. This box set includes an extra slot for the Jurassic World Blu-ray, which should be out later this year. Under the Knife. While we mourn the cancellation of Constantine, the usually-somewhat-banal Gotham has its moments of brilliance. The detectives are on the case of the Ogre (a refreshingly long villain arc, and played with appropriate charm and sliminess by Heroes' Milo Ventimiglia), who seems to be targeting Barbara. Jim and Selina have a moment of mutual law-breaking, while Nygma and Cobblepot get closer and closer to full-blown supervillainy. Kill the Boy. After last week's devastating Sons of Harpy attack, Daenerys must show if she truly has it in her to rule like a Queen. Brienne and Pod continue their search for Sansa, who we desperately hope isn't married off to Ramsay Bolton any time soon. Barcelona put Pep Guardiola's Bayern Munich to the sword with three late goals including two from the irrepressible Lionel Messi. Neymar effectively killed the tie late on, but Pep will be holding out hope of pulling out some sort of result. This isn't Mission: Impossible for Bayern, but it is Mission: Very Bloody Difficult. Grodd Lives. Grodd the Gorilla is unleashed by Reverse Flash, hoping to distract Barry and his friends away from capturing him. It works, as this isn't just any gorilla. It's an intelligent, telepathic gorilla born out of the super-solider programme. You want to see The Flash fight a giant meta-gorilla before the series finale? You got it. Flash/Arrow fans will also be happy to know that a spin-off show called Legends of Tomorrow has been greenlit for a full series. Arthur Darvill (Rory Williams from Doctor Who), plays rouge time-traveller Rip Hunter, while Dr Martin Stein, Captain Cold, Heat Wave and Ray Palmer/The Atom will join in from their own shows. The Devil Quotes Scripture. The Lyon family get a taste of what life would've been like if Luscious (Terence Howard) hadn't become a hit. Elsewhere, a woman gets involved in the relationship between Hakeem and hip-hop star Tianna. Verbis Diablo. Vanessa is further haunted by the witches, while Evelyn Poole distracts an enchanted Sir Malcolm. As the characters deal with their own troubles, Egyptologist Ferdinand Lyle reveals the chilling backstory of the Verbis Diablo (the corruption of angelic speech). Jonah Hill and Channing Tatum star in this packed-with-laughs film remake of the 90s teen show that shot Johnny Depp into fame. Two hapless police officers (a former nerd and jock respectively) go undercover in a high school to investigate a drug gang. But the high school ecosystem has changed since they last were there: it's cool to care about the environment now, and nerds are in. As the boys deal with their newfound social statuses, they must also figure out which of their new friends will help them expose the drug ring. This Golden Globe-winning drama hits Sky Atlantic in a ten-part series that explores - as you might have guessed - an extramarital relationship that sees Dominic West (of The Wire fame) play a married teacher who has an affair with a married waitress, played by Ruth Wilson. My name is Oliver Queen. It's the series three finale, and Team Arrow is back together for the final fight with the League. Ra's Al Ghul's master plan puts everyone in danger, but will Oliver be able to save everyone in time? It's revealed that there's a sleeper agent in MI5's ranks with connections to the US military. This causes Joe and Jim to reconsider who they can really trust. Pilot. M. Night Shyamalan's Twin Pines-esque mystery starts this week but will it get off to a good start or flounder? We're hoping for the former. The Milk and Honey Route. The penultimate episode of Mad Men - just one more and then it's gone forever! We wish it wasn't ending so quickly. Everyone is still adjusting to the soulless, corporate ways of McCann advertising, but it's proven toughest for Don. Tough enough that he's left for good. He's been having trouble sleeping as he goes on the run, and we wager that his past will creep up on him. Meanwhile, Pete gets blindsided by a former associate, and Betty discovers some shocking news. The queen of home cooking is back on our screens for a six-part series. Mary takes inspiration from her childhood holidays at the seaside: goats cheese and shallot tarts, crab and cod fishcakes with tomato salsa, sea bass with brown shrimp and caper sauce. That's a lot of dishes in an hour. No visit to the seaside is complete without ice cream, so Mary finishes off with a delectable and decadent knickerbocker glory. Yum. The Frenemy of My Enemy. Coulson needs help infiltrating Hydra, and the only person he can turn to is their greatest enemy: Grant Ward. Tensions rise as Fitz struggles to work with Ward, while back on the bus, Simmons struggles to deal with all the backstabbing and betrayal. Meanwhile, Skye has a father-daughter day with Cal as she finds out more about her past and family. And we can't be happier that Agents of S.H.I.E.L.D. and Agent Carter (which really needs to be picked up by a UK channel) have both been renewed for yet another series! BBC's economics editor Robert Peston has guest host duties tonight, as Ian Hislop, Paul Merton and their fellow panellists look back at the week after the election. Southampton's season has petered out, losing to relegation threatened Sunderland and Leicester. They'll be hoping fortune favours them when they take on Tim Sherwood's Aston Villa, who are ending the season in good form. Highlights from the opening ceremony of the Diamond League in Doha - the first of 14 meets around the globe - with some of the world's best athletics competing, including double Olympic and world champion Mo Farah. A riveting crime thriller from Alfred Hitchcock, based on the true story of the Leopold-Leob murder case. Often described as 'the crime of the century', the two wealthy, intelligent men supposedly committed the act in an effort to show they could commit 'the perfect crime' and get away with it. James Stewart takes the lead in a film that is technically famous for appearing to be one continuous shot - 66 years before Birdman did it. "We wish to know why is there no more magic done in England?" A gorgeous seven-part adaptation of Susanna Clarke's critically acclaimed novel set in an alternate history of 19th century England, where magic has re-emerged after centuries of lying dormant. Two men - a cantankerous old Mr Norrell (Eddie Marsan) and a young gentleman Jonathan Strange (Bertie Carvel) - are the only ones capable of using magic, and their companionship turns to rivalry as their powers increase. Factor in a bet with a mysterious, chaotic entity known as the Gentleman With The Thistle-Down Hair, the backdrop of the Napoleonic Wars and stunning special effects, and you have the kind of storytelling that invokes Tolkien, Dickens and Martin. This match is all about finishing as high up in the table as possible with Arsenal's Champions League place secured and United's now pretty much confirmed. Arsenal grabbed a win at Old Trafford earlier this year, but United will want to finish with a flourish to make-up for an under-whelming season.